NOTE: When reading this narrative, the four bible pages are readily available reference. Please click on the links below the page or the document to see a large view. Early Christian families fortunate enough to have a family bible were comforted by the word of God in their homes and used the bible as a storage place for vital family records. This was true for Jonathan Yankey/Yankie and Sarah Armstrong. They were married near the town of Louden, Franklin Township, Adams County, Ohio on "Thursday, Feb. 23rd, 1832". The record of their marriage was their first bible entry in the beautiful hand of Sarah Armstrong Yankey. There is speculation that Jonathan Yankey, born in a German speaking family, possessed little, if any, English writing skills. There are no known records written by Jonathan Yankey. Jonathan and Sarah Armstrong Yankey are the great-great-grandparents of the author. The County Marriage Book has the following entry recorded April 23, 1832: "The State of Ohio Adams County, I, Samuel E. Snyder, a regular ordained Minister of the gospel of the Christian Church, do hereby Certify that I this day joined Jonathan Yankee and Sally Armstrong in marriage according to law given under my hand and seal this 23rd day of February 1832. signed---Samuel E. Snyder." As important family events occurred, more records were added to the bible pages, including births, marriages and deaths. Jonathan and Sarah entered the records of their own birth dates. "Jonathan Yankey (son of Michael and Malinda Yankey) was born April 24th, 1806"
Jonathan was born in Rockingham County, Virginia, the son of Michael and Magdalene Hottinger Yankey of German/Swiss background. Although documentation has not yet been secured, family research has identified an immigrant, Andrew Jaencke, arriving on the Moravian ship, Irene, on June 22, 1750. He was a member of the Henry Jorde Colony of Moravian followers, entering at the port of New York with the intended destination of Bethlehem, Pennsylvania. Andrew Jaencke may have been the immigrant that started the Yankey family in America but this is yet to be proven. In 1783, Michael Yankey and his brothers, Jacob and Andrew, were "bound out until age 14" by Shenandoah County Circuit Court to local German families, Nease, Bird and Zerkle living near the Shenandoah and Rockingham County line. Michael and Magdalene Hottinger Yankey are the great-great-great-grandparents of the author. "Sarah Yankey (wife of Jonathan Yankey) was born November 19th, 1810." Sarah was born in Franklin Township, Adams County, Ohio, daughter of immigrant parents, William and Jane Corson Armstrong of Irish/Scots background. William Armstrong born circa 1770 in Ireland came to Adams County Ohio in 1803 and settled near Louden, Ohio in the Virginia Military District. Jane Corson Armstrong was born in Scotland. It is not known whether William purchased or inherited 500 acres known as the south half of Survey No. 1014. A John Armstrong purchased the land from Abraham Shepherd of Berkeley Co., Virginia on December 25, 1799 for $450.00. Mr. Shepherd had been granted a patent of 1000 acres on June 12, 1798 and it is believed that Abraham Shepherd was only in Ohio to dispose of this land. This land was registered in the name of John Armstrong on March 12, 1800. Ohio became a state in 1803, the first state to be carved out of the Northwest Territory. William and Jane Corson Armstrong are the great-great-great-grandparents of the author. At least seven children were born to Jonathan Yankey and Sarah Armstrong before Sarah's untimely death. All were born on 500 acres of land once owned by their grandfather, William Armstrong, located on Baker Fork and Ohio Brush Creek, bordering the north side of Serpent Mound State Park. On April 19, 1839, Jonathan and Sarah Yankey purchased 110 acres on the west side of the Armstrong Estate from Jane Armstrong, age 61, widow of William Armstrong, for $50.00. James Minor Yankie was born April the 21, 1852"
We note the change in handwriting on the birth record page. For some reason, Sarah did not actually write the birth records of her two youngest children, Sarah Angeline and James Minor. Four years after the marriage of Jonathan and Sarah, William Armstrong (Sarah’s father) died on May 10th, 1836 and was buried in the Armstrong Cemetery, a short distance north of the Armstrong family home. Four years later, Sarah lost her beloved sister, Mary Armstrong, who died December 4th, 1840. Mary was buried near her father in the Armstrong Cemetery. The first tragedy in the Jonathan and Sarah Yankey family came with the young adult death of William Jefferson Yankey, first-born son of Jonathan and Sarah Yankey, on June the 6th, 1855, age 21, cause of death unknown. He was buried in the Armstrong Family Cemetery, within sight of Sarah's childhood home. Seven months after the death of William Jefferson Yankey, "Sarah Armstrong Yankey died on February the 17th, 1856", nine months before she was forty-six years old. She was survived by her husband, Jonathan, and six children ranging in age from 3 years to 19 years, brothers John and William Jr., sister Margaret Jane Campbell and her mother, Jane Armstrong. Sarah was buried in the Armstrong Cemetery next to her son, William Jefferson Yankey. Jonathan Yankey, age 50, did not wait long before finding a new wife and mother for his six children, marrying Elizabeth Lawrence on November 7th, 1856. Note the handwriting change and the family name spelling change from Yankey to Yankie from this date onward. No reason for the spelling change has been determined. We know that Jonathan's brother, Michael Yankey, Jr., living nearby in Ohio did not change the spelling of his name. However, another brother of Michael Jr. and Jonathan, William A. Yankie of Yazhoo County, Mississippi did change the spelling of his name. The brother that remained in Virginia, Jacob, retained the Yankey spelling. We may never know the reasons for the spelling difference. Mahala Jane Yankie, age 19, married Jacob Yankie in ca 1857 and had at least one child, Allie L. Yankie. It was not uncommon for relatives to marry and there are several examples of this in the Yankey and other related families. The outbreak of the Civil War brought more pain and suffering for the Yankie family. Jacob Yankie, husband of Mahala Jane Yankie, disappeared from the family records and may have been lost in the war but this premise is not proven. We do know that Mahala Jane married again in 1863. Milton Nelson Yankie, age 20, was a member of the 70th Regiment, Ohio Volunteer Infantry, organized at West Union, Ohio, October 14, 1861 and moved to Ripley, Ohio December 25. Milton Nelson Yankie died in service of his country (Christmas Day), December 25, 1861 aged 20 years, 6 months and 11 days. Milton is buried in the Armstrong Family Cemetery, next to his mother, Sarah Armstrong Yankie. Allie L. Yankie, daughter of Jacob and Mahala Jane Yankie died April 6, 1862 "in the fourth year of her age" and is buried near her grandmother, Sarah Armstrong Yankey, in the Armstrong Family Cemetery. John Milton Yankie, age 25, was a member of Company E, 63rd Regiment, Ohio Infantry organized on January 25, 1862 at Marietta, Ohio by combining Battalions of the 22nd and the 63rd Ohio Infantry.They moved to Paducah, Kentucky in February, advanced to New Madrid, Missouri, March 3-14, and the siege and capture of Island Number 10 in the Mississippi River, then to Tiptonville, Tennessee April 8, Hamburg Landing, Tennessee April 18-23, Monterey, Tennessee April 29, and the skirmish at Farmington, Tennessee May 1. John Milton Yankie died in service of his country, May 12th, 1862 and is buried at the Jefferson Barracks National Cemetery, St. Louis, Missouri. Mahala Jane Yankie married William Jefferson (Dove) Yankie in Clark County Ohio on June 4, 1863. William Jefferson Yankie was a member of the 63rd Ohio Infantry, joining the same unit and on the same date as John Milton Yankie, and was disability discharged on June 12, 1862 at Camp Chase Ohio.To this marriage was born at least four sons, the first born being Jay Trimble Yankie on December 14, 1867. The August 3, 1870 Census records show this family living in Perry Township, Pike County, Ohio. William J. Yankie, shown as a laborer, born in Virginia; Mahala J. Yankie "keeping house", born in Ohio; Jay T. Yankie, 2 years old, born in Ohio. William Jefferson and Mahala Jane Yankie are the great-grandparents of the author. Joseph Trimble Yankie, age 19, enlisted in the 141st Regiment, Company K, Ohio National Guard, was one of the famous One Hundred Day Men from Ohio. He mustered in at Gallipolis, May 11, 1864 with 866 men under Colonel Anderson L. Jaynes, left Ohio on May 21, 1864 for Charleston, WV to be attached to the Reserve Division of West Virginia until August 25 and mustered out September 3, 1864. Joseph Trimble survived the Civil War and moved to Silver City in the New Mexico Territory for a fourteen year adventure in the very wild west, returning to Ohio a wealthy man in 1884 to marry and raise a family of five sons. Jonathan and Elizabeth started a family of their own. Margaret Z. Yankie was born August the 22nd, 1862, but she died only seven weeks later on October the 5th, 1862. Nelson Ferdinand Yankie, son of Jonathan and Elizabeth Yankie, was born February 29th, 1864. At this time of Jonathan's life, five of his nine children were living: Mahala Jane (25), Joseph Trimble (19), Sarah Angeline (15), James Minor (9) and Nelson Ferdinand (newborn). Sarah Angeline Yankie married Josiah Swisshelm November 1st, 1866. Josiah Swisshelm, son of George and Christina Yankey Swisshelm, was born December 26, 1841 in Adams Co, Ohio. From "A History of Adams County, Ohio, 1900" by Nelson W. Evans and Emmons B. Stivers: "Josiah Swisshelm was born, reared, educated, spent his younger days winning the hand of a good wife, Sarah Angeline Yankie, in Adams Co, Ohio. Mr. Swisshelm spent three years and eleven months at the front in defense of his country. He enlisted and was chosen Corporal of Company "K", 188th Ohio Volunteer Infantry and anyone who knows the history of his regiment will at once realize that Mr. Swisshelm did not play during his soldier days; and his record as a soldier is gilt edged. He was discharged at the close of the war and settled down to farm life. For several years he operated a threshing machine and he had the distinction of having introduced the first steam thresher into Adams and Highland Counties. In 1882, he removed to Sinking Springs and engaged in the mercantile business which he continued until he came to Peebles in 1882 as a member of the Peebles Lumber Company and is also engaged in merchandising. The past three years he has been one of the trusted and experienced salesmen in the employ of H.B. Gaffin. He owns a fine farm and occupies one of the prettiest residences to adorn Walnut Street. Mr. Swisshelm, recognized as one of the best citizens; a prominent member and active worker of the Methodist Episcopal Church and a member of the Peebles Lodge, Knights of Pythias." Josiah Swisshelm died February 15, 1923 and is buried in Locust Grove Cemetery next to his wife, Sarah Angeline, who preceded him in death on July 8, 1911. They were survived by their children; daughter, Eunice A Fitch; son, Ulysses Ashton and daughter, Myrtle Norte. The first child, Allie L. Yankie, died in the "Fourth year of her age" April 6, 1862, daughter of Jacob and Mahala Jane Yankie. Jay Trimble Yankie, first son of William Jefferson and Mahala Jane Yankie, was born December 14, 1867. Homer Yankie, third son of William Jefferson Yankie and Mahala Jane Yankie was born October 13, 1874. The birth dates of Jay Trimble Yankie and Homer Yankie were recorded on the DEATHS page of the bible in 1968 by Charles Ashton and Mary Yankie after they received custody of the bible at the deathbed of Margaret Wasdahl Yankie, wife of Homer Yankie, in Oaks, North Dakota. Jay Trimble Yankie, born December 14, 1867, is the grandfather of the author. Jay T. married Carrie Idona Evans, born July 10, 1874 in Rantoul, Champaign Co., Illinois. They were married on September 1, 1895 in Rantoul, Illinois. Jay T. and Idona relocated to Breckenridge, Gratiot Co., Michigan in 1915, living the remainder of their lives on their farm at 8686 Ransom Road. Carrie Idona Evans Yankie died November 11, 1935 and Jay Trimble Yankie died October 7, 1954, both buried in Ridgelawn Cemetery, Breckenridge, Michigan. Edgar Daniel Yankie (named after his grandfather, Daniel Evans) was born November 21, 1898 in Casey, Clark County, Illinois and died April 16, 1965 in Gaylord, Otsego Co., Michigan, buried in Ridgelawn Cemetery, Breckenridge, Michigan. Edgar Daniel Yankie is the father of the author. Charles Ashton Yankie (named after his cousin, Ulysses Ashton Swisshelm) was born January 16, 1906 in Ludlow, Champaign County, Illinois and died November 25, 1973 in Breckenridge, Gratiot County, Michigan, buried in Ridgelawn Cemetery, Breckenridge, Michigan. 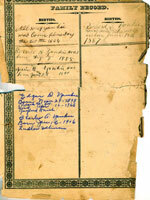 These death records for Edgar and Charles were entered by Mary A. Lowrey Yankie, wife of Charles Ashton Yankie. Jay Trimble Yankie told his children that his father was killed in a mill accident when Jay T. was a youngster (age 13-14) and that his own left arm was severely injured in that accident, causing permanent damage to his elbow. No other details are known, nor do we know where his father was buried. We also have no record of Mahala Jane Yankie after this accident, no death date, no burial location, not even a family story. She disappeared. Marquis De Lafayette, born 1872, grew to maturity but with no known family. Verbal family history claims that Marc was a young clothing salesman when he died in a train accident in or near Cincinnati, Ohio. No death or burial information is known. Homer Yankie, born October 13, 1874, joined the U.S. Army at Fort Leavenworth, Kansas on April 5, 1895 assigned to Troop C, 6th Cavalry, 20th Regiment. He was in Cuba during the Spanish American War in 1898, Manilla, Phillipine Islands, Fort Sheridan, Illinois, Presidio of Monterey and Fort McDowell, California. He retired from the military on March 31, 1919 and married Margaret J. Wasdahl in Oakland, California on November 5, 1920. Homer Yankie died in Hot Springs, Arkansas on March 28, 1946 and is buried in the Little Rock National Cemetery, Little Rock, Arkansas. Margaret Wasdahl Yankie died in Oaks, North Dakota September 25, 1968. Milton Fletcher Yankie, born July 27, 1878, died a young boy on May 17, 1886 at the age of 7 years, 9 months and 12 days. He is buried in the Armstrong Family Cemetery. The inscription on the gravestone: "Asleep in Jesus, blessed sleep from which none ever wake or weep". Cause of death unknown. Joseph Trimble Yankie and Margaret Vinton Patton were married on November 11, 1884 in Ohio. 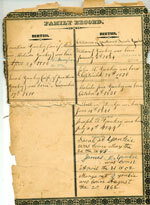 Joseph Trimble Yankie traveled to the New Mexico Territory in 1870 and is listed on the Silver City, New Mexico census with his partners John Bullard, James Bullard and John Swisshelm. John Swisshelm was an Ohio cousin of Joseph T. Yankie. Brothers, John Montgomery Bullard and James Barger Bullard were Confederate officers from Boone County, Missouri. John Bullard was killed in a battle with Apaches on Feb. 23, 1871 age 29 years, the first man buried in the Silver City, New Mexico cemetery. After some fourteen years of successful prospecting, ranching and hotel businesses, Joseph T. returned to Peebles, Ohio to marry and raise a family. We are aware of an earlier family in New Mexico from newspaper accounts of the death of Mrs. Yankie and the kidnapping of their four-year-old daughter by the Apache. Lowell (Doc) Wilson Yankie - - -"Druggist in Cincinnati, Ohio"
Joseph Trimble Yankie died June 12, 1926 and Margaret Vinton Patton Yankie died in 1943, both are buried at Pleasant Hill Cemetery, Sinking Springs, Highland Co, Ohio. 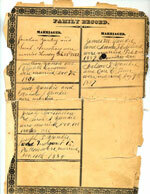 James Minor Yankie and Anna F. Copland were married February 2, 1887 (Goundhog Day). James Minor Yankie followed his brother, Joseph Trimble Yankie to the New Mexico Territory in the 1870s, prospecting for gold, silver and copper. He was successful in his ventures but followed his brother's example by returning to Adams County Ohio and married life in 1887. After only a short time in Ohio, James Minor and Anna moved to the Los Angeles, CA area to make their home. James Minor died February 13, 1928 in Los Angeles, California. Nelson Ferdinand Yankie married Orie Edith Tener August 9, 1887 in Adams County Ohio. Two sons were born to this union, both born in Adams County Ohio. Russell H. Yankie was born August 7, 1888 and Jessie O. Yankie was born January 21, 1890. A few years after the birth of Jessie O. Yankie, Nelson and Orie moved their family from Adams County to Darlington, Gentry County, Missouri. Moving with them were Nelson’s elderly parents, Jonathan (age 86) and Elizabeth Yankie (age 73). We believe this group was attracted to Missouri by the sister of Sarah Armstrong Yankie, Jonathan’s sister-in-law from his first marriage, the family of Lewis and Margaret Jane Armstrong Campbell who had relocated to Darlington shortly after the Civil War. In 1900, Lewis Campbell was 84 and Margaret Jane Armstrong Campbell was 80 years old. Jonathan Yankie died April 12, 1896 (12 days before his 90 th birthday) and Elizabeth Lawrence Yankie died July 22, 1898 (age 79) both buried in Rouse Cemetery, Darlington, Gentry Co., Missouri. Nelson Ferdinand Yankie moved his family to Carthage, Missouri after the death of his parents and remained there until his death. Nelson Yankie (age 67) died in Carthage, 12:25 a.m., March 10, 1931 and is buried in the Park Cemetery in Carthage. Buried next to her husband is Orie Edith Tener Yankie (age 70), born June 25, 1867, died June 24 1937. Jessie O. Yankie (age 68), son of Nelson F. and Orie E. Tener Yankie, died May 30, 1958 in Carthage, Missouri and is laid to rest in the Park Cemetery Mausoleum. Next to her husband is Bessie M. Yankie (age 90) born April 12, 1891, died March 21, 1982. This completes the first narrative of the Family Bible of Jonathan Yankey/Yankie. 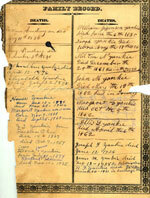 To my knowledge, this is the only such document to bring life stories to Jonathan's Bible pages. Each person listed in the bible is mentioned in this narrative. The bible has traveled a bit from the Franklin Township, Adams County, Ohio farm of Jonathan and Sarah Armstrong Yankey to Darlington, Missouri, on to Carthage, Missouri with Nelson Yankie then handed over to Homer Yankie in Hot Springs, Arkansas. After the death of Homer Yankie, his widow Margaret Wasdahl Yankie moved the bible to Oaks, North Dakota. It was then entrusted to Charles Ashton Yankie and moved to Breckenridge, Michigan and now to the custody of Gerald WayneYankie in Santa Barbara, California.